This post was originally published in the Watford vs Birmingham City Matchday programme on 28th August 2011. That’s one of the pre-programmed phrases muttered by Andy Gray in the latest edition of the FIFA series of football video games. 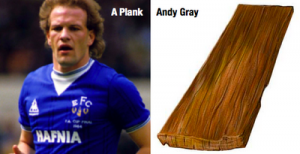 Whilst yes, I know Andy Gray is a plank and yes, I understand I am too old to be playing video games, the phrase does mirror the thoughts that I was having ahead of the start of this season – for our relatively small and inexperienced squad, a good start would be vital. Well, we’re undefeated away. No complaints there. However, we are of course yet to register a point here at Vicarage Road, giving rise to some concerned chatter among fellow Watford fans. My voice is not among them. Naturally I would have loved us to get the win we deserved against Derby and any sort of victory over West Ham is always treasured, but losing these two games doesn’t mean we’re in trouble. It’s worth remembering that Sky’s Saturday morning football TV show “Soccer AM” used to publish league tables at this stage of the season – as a joke. Let’s look at the facts. We were unlucky not to beat Derby, a game in which we could still be playing in August next year and we still wouldn’t have scored. It was one of those games. Even the most staunch Hornet will admit we were outplayed by West Ham, but if they aren’t in the promotion shake up come April, I won’t be the only one who’s surprised. So four games in and the only time we’ve looked in trouble is against promotion favourites. Add into the mix the fact that our Manager has now had a grand total of four games in charge at this level. Four. I don’t know about you, but on my fourth day in a new job I’m still learning and I expect to be cut some slack. If you don’t think Sean Dyche is committed to doing his best for this football club as quickly as possible, then please feel free to go and discuss it with him, just make sure I’m at least two counties away when you do. A number of our playing staff are equally new to the club. They, like our Manager, are finding their footing in new roles and surroundings. I think the majority of Hornets fans were happy with our summer transfer dealings and I see no reason for us to change that point of view just yet. We need to score goals. We need to win matches, of course we do, but we all need to work at it. Stick together, support each other and earn those wins. We’ve got the talent, we’ve got the desire and passion, we’ve got the time. It took Alex Ferguson three years to win anything at all with Manchester United. Three years. We’ve had four games. Keep the faith and get behind the team. Together we’ll nail it.